How efficient is the encoding/decoding algorithm of BASE64 class in Java? I am about to use an algorithm to encode a variable length but very long String field retrieved from an XML file, then that encoded data should be persisted in the database. Later, when I recieve a second file I need to fetch the encoded data from database (previously stored) and then decode it and validate with the new data for duplicate. which works perfectly fine and solves my problem. But it converts 55 char string to just 6 char String. So I wonder if there is any case where these algorithm encodes 2 Strings which are very large and have only 1 char mismatch (for example) into same encoded byte arrays. I donot know about the Base64 class much but if anyone can help me out it will be really helpful. If you can suggest any other Algorithm which makes a large String short of fixed length and solves my purpose I will be happy to use it. Also, using sun.misc classes gives a non-portable application. Base64( UTF8( "test" ) ) => "dGVzdA=="
Base64( UTF16( "test" ) ) => "/v8AdABlAHMAdA=="
Here you are converting the string to byte array and using lossless compression to reduce the number of bytes you have to store. You can vary the char encoding and compression algorithm to reduce the number of bytes depending on the Strings you will be storing (ie if it's mostly ASCII then UTF-8 will probably be best. I just saw your comment - it seems you're actually looking for compression rather than hashing as I initially thought. Though in that case, you won't be able to get fixed length output for arbitrary input (think about it, an infinite number of inputs cannot map bijectively to a finite number of outputs), so I hope that wasn't a strong requirement. In any case, the performance of your chosen compression algorithm will depend on the characteristics of the input text. In the absence of further information, DEFLATE compression (as used by the Zip input streams, IIRC) is a good general-purpose algorithm to start with, and at least use as a basis for comparison. For ease of implementation, though, you can use the Deflator class built into the JDK, which uses ZLib compression. 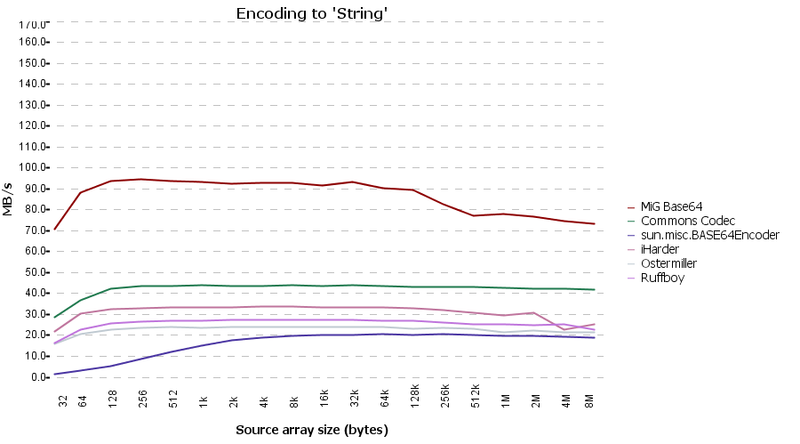 If your input strings have particular patterns, then different compression algorithms may be more or less efficient. In one respect it doesn't matter which one you use, if you don't intend the compressed data to be read by any other processes - so long as you can compress and decompress yourself, it'll be transparent to your clients. What's a good compression algorithm for Java? Is there any java compression utility? Not the answer you're looking for? Browse other questions tagged java encoding base64 apache-commons-codec string-decoding or ask your own question. What's a good compression library for Java?